The dreaded finale to a trilogy could be the most difficult film to successfully execute for any franchise, especially one that is lauded and accompanied with such high expectations as The Dark Knight Rises arrives with. The Batman reboot, headed by the auteur Christopher Nolan, has established a darker, more sinister edge with depth-rich characters that struggle with aspects of identity and moral choice. In the wake is a great introduction with Batman Begins and the near perfect sequel The Dark Knight, leaving only the final act in the Dark Knight chapter to trudge up the mountain of high expectation. And, with Internet buzz and plot rumors around every corner how could it succeed? Well, The Dark Knight Rises is an impressive feat that provides a suitable and satisfying conclusion to an outstanding saga. The film begins with a spectacular mid-air sequence in which we are introduced to the masked villain Bane (Tom Hardy), a hulking and menacing threat, who is prophesying destruction on the world. The restored Gotham City has taken control of crime however the sacrifice is weighing heavy on the mind of Commissioner Gordon (Gary Oldman). Gotham doesn’t need Batman anymore, so it seems, and Bruce Wayne (Christian Bale) has been living as a recluse in Wayne Manor for the past 8 years however aided by the ever-compassionate voice of reason Alfred (Michael Caine). Batman does not possess super powers, underneath the costume he is a man, and Bruce Wayne has been feeling the side effects of the physical life of the hero. 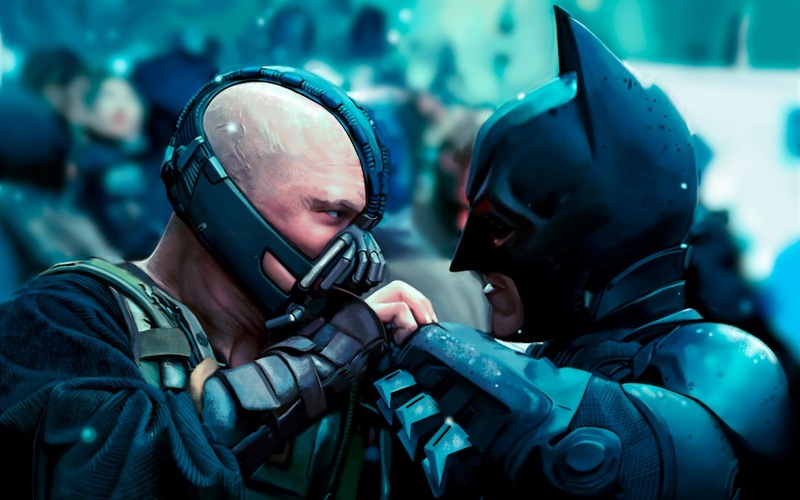 Bane’s setup is complex and involves plans that directly threaten Gotham City and Batman. Bane is an unforgiving, yet intelligent tyrant, determined to restore balance to the world through the destruction of Gotham and the implementation of civil anarchy. Bane isn’t the only criminal in Gotham; the lovely Selina Kyle (Anne Hathaway) is a cat burglar who steals from aristocrats, one of who is Bruce Wayne, and her theft of a family heirloom provokes Bruce out of seclusion and back into the cape to investigate. While Bruce Wayne has been absent his enterprise has been suffering. Lucius Fox (Morgan Freeman) is trying save the business by partnering with philanthropist Miranda Tate (Marion Cotillard) who is planning on using the company’s technology to provide clean, sustainable energy for the world. However, Bane has other plans for Wayne Enterprises. The story, however complex, dreadful, and dark, is something that needs to been seen before spoilers abound. It’s terrific and encompasses the whole of the Dark Knight story in clever and ingenious ways. There is some interesting social commentary going on as well; correlations to the economic woes of our society, the Occupy movement, class identification, and our nations overwhelming need for control and dominance are all examined in some form. Nolan is an amazing director; he understands the dynamic of character development and how to build dramatic elements around spectacular action sequences. This is a complicated film to direct and write, there are loose ends that need to be wrapped up and character dilemmas that need to solved, and to a point those aspects are accomplished. The addition of new characters and how they function within the story makes it complicated at times, which makes for a small flaw in execution. The acting is impressive. Christian Bale is good as Batman but even better as Bruce Wayne. The fact that Batman is missing for a large portion of the first act could hinder the film, but Christian Bale does such a good job as Bruce Wayne it actually improves it. The film gives more time to Gary Oldman, Morgan Freeman, and Michael Caine, definitely not a bad thing considering they own each of their characters in inspiring ways. 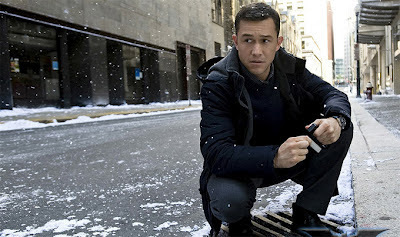 Anne Hathaway is good as the self indulgent Selina Kyle, as is Joseph Gordon-Levitt who plays John Blake an overzealous cop that understands what is truly at stake for Gotham City. Tom Hardy has the difficult task of following up the performance of Heath Ledger’s Joker. Hardy is good as Bane; it’s a difficult role considering much of the emotion of the character must be portrayed through the eyes since his face is covered with a voice-altering mask. Hardy has proven overly capable of being able to embody numerous characters in past films, and he does his best with the slightly obscured and confusing personality of Bane. 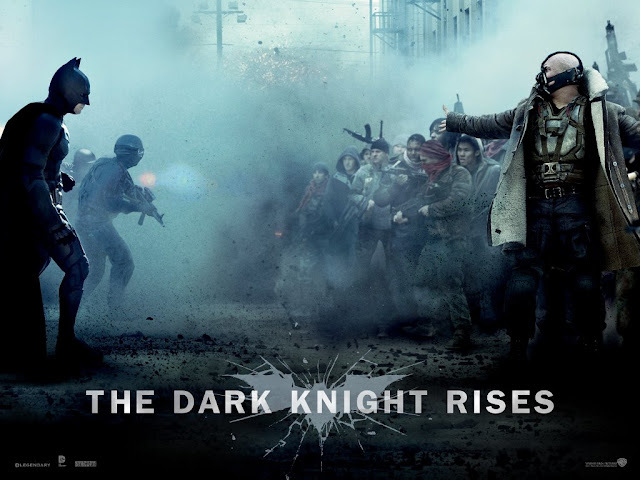 The Dark Knight Rises is a striking and captivating film that builds on the sturdy foundation of the first two films. Superhero films are inherent with familiar trappings, it’s not often that one continuously excels and remains engaging, especially one that runs nearly three hours long. Enjoy The Dark Knight Rises, it offers a fitting finale to an impressive trilogy. You honestly aren’t going to get any better than this when it comes to pure, summer entertainment, nor with superhero flicks. That is, until the new Superman flick graces the screen. However, this is Batman’s time to shine and he does it perfectly, especially for his last time with Nolan and Bale involved. Good review Monte. Thanks for reading. I really appreciate it. It's interesting now that I have read some reviews how many people didn't like the film. It seems like they went into the film looking for things not to like. I was entertained from the start of this film, yeah there are flaws in the narrative but I didn't think they were obvious enough to hurt the film. Anyways, thanks again for reading, I really appreciate your support.